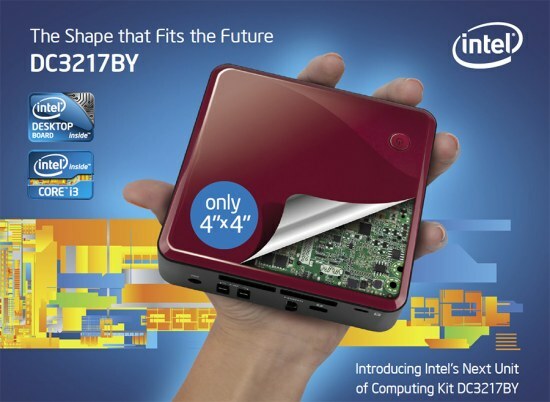 The NUC (next unit of computing) mini personal computer from Intel will, like so many other PCs, be upgraded as soon as Chipzilla launches its newest CPU series, in June or later. NUC is Intel's attempt to start making a name for itself on the market for full-feature PCs, even though it is actually a barebone. The problem with the current configurations is that they are just too expensive, even five months after they first debuted. The ones equipped with Core i3 CPUs sell for $280 / 280 Euro to $310 / 310 Euro, while the ones using Celeron CPUs are priced at $170 / 170 Euro. Ideally, when Intel launches new Haswell CPUs, or upgrades the NUC with Ivy Bridge Core i5 chips, the prices would stay the same, or maybe even go lower. Knowing Intel's habit of bullishly sticking to its prices, however, we fear there is just as high a chance for the tags to go even higher. It is LogicSupply that said the update was coming, and we don't have a reason to disbelieve the claims as of yet. Since only the chips will be replaced, the hardware will be the same small mainboard, a pair of DDR3 SO-DIMM memory slots, an mSATA solid-state drive, a mini PCI Express Wi-Fi/Bluetooth module, two HDMI outputs and 1 Gigabit Ethernet. There is another barebone model, called DC3217BY, which has a single HDMI output and replaces the Gigabit Ethernet for Thunderbolt. Curiously, analog audio is absent from both (DP or TB ports for audio output are employed instead). And with having to buy memory and an SSD on top of everything, the final NUC prices will reach $330 / 330 Euro to $470 / 470 Euro, which makes one wonder why not buy a tablet instead. Then again, the NUC is much stronger, runs Windows and is quite small itself (4.59x 4.41 x 1.55 inches / 116.6 x 112 x 39 mm), so it should still charm people.